Next Monday, October 12th, is Columbus Day. When I was a kid, Christopher Columbus was a hero—at least in my mind. Parts of the poem “In 1492” remain ingrained in my brain: In fourteen hundred and ninety-two, Columbus sailed the ocean blue. He had three ships and left from Spain. He sailed through sunshine, wind, and rain… It was only much later I learned that Columbus wasn’t the guy I thought he was. Though Columbus’s legacy is now tarnished by discoveries of kidnapping, enslavement, murder, and worse, I still have to give the guy props for bravery. After all he did set sail not knowing for certain whether the earth was flat or round. That took some guts—sort of like blasting off into space without knowing your final destination! 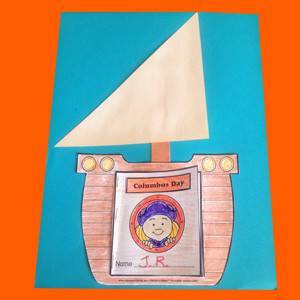 If Columbus is part of your Monday teaching plans, check out our Columbus Day collection at TheMailbox.com by clicking here. You can filter your choices by grade level and print what you need in a nano second. Find the booklet project shown by clicking here. And if you haven’t yet entered our October giveaway, do so before Columbus Day! The last day for entries is Sunday, October 11. Here’s the link! So cute! Thank you for sharing this cute idea!